AAEI has opened Early Bird Registration for the 98th Annual AAEI Conference & Expo, which will be held in Washington, DC June 26-28, 2019. The featured keynote speaker will be CBP Commissioner Kevin McAleenan. 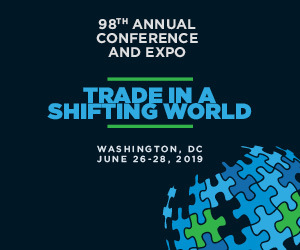 AAEI’s theme for 2019 is, Trade in a Shifting World. Everyone involved in trade is challenged to keep up with the flow of change which has been fueled by advancing technology, politics and risk mitigation. This year’s AAEI conference program is designed to provide tools for practitioners seeking insights on policy and strategy, as well as compliance and operations. And other details about this year’s important event, please visit the AAEI Conference Website.